Witches and goblins and firefighters, oh my! Here at Hines Little Smiles, we love Halloween and the joy it brings to our valued patients. However, parents everywhere are increasingly concerned about the damage that single night of sugar-coated bliss could have on your child’s teeth. Rest assured, there is nothing wrong with your child eating a little candy (or a lot of candy) once in awhile. 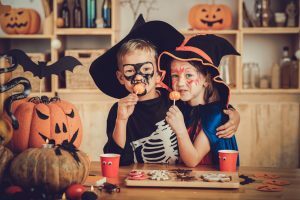 Here is some information that you might find helpful this Halloween, so that you can relax while your child goes trick-or-treating. Contrary to popular belief, sugar can’t damage your child’s teeth on its own. However, simple sugars are the main food source for oral bacteria, which create enamel-eroding acids as they thrive in your child’s mouth. These acids can dissolve tooth enamel, creating cavities, discolorations, and infections. Research has shown that sugar causes more damage to the teeth when the teeth are exposed to sugar time and time again, and when the duration of sugar consumption isn’t monitored. For example, sucking on a sucker for hours at a time causes more damage than enjoying a single candy bar in a few minutes. For this reason, you shouldn’t worry too much if your child has a non-sugary diet the large majority of the time, and then enjoys a few treats once in awhile. When it comes to protecting your child from oral decay, preventive care is exceptionally powerful. Our Columbus pediatric dentistry office offers a wide variety of different preventive care treatments in addition to routine cleanings, including dental sealants, deep-cleanings, and fluoride treatments. If you are concerned about keeping your child’s teeth safe on Halloween, schedule an appointment to have sealants applied before the big day. Sealants are a completely invisible, long-lasting plastic coating that is painted onto the molars to protect them from acid erosion and plaque accumulations. Also, since sealants fill in the crevices present along the biting surfaces of these teeth, they can make it easier for your child to brush and floss effectively. Fluoride treatments help to strengthen the molecular structure of enamel, making teeth less vulnerable to dental decay. Another great way to protect your child’s oral health during this holiday season is to focus on proper hydration and diet. Offer your child healthy fruits and veggies to snack on instead of bowls of leftover treats. Encourage your child to drink plenty of water before and after meals, and even after they enjoy a sweet treat. Swishing the mouth with water can help to rinse away sugars and dilute oral bacteria. Last but not least, don’t forget to screen that candy bucket for treats like strong caramels, old taffy, or hard candies that could damage your child’s teeth. Caramels and taffy could pull out existing dental fillings, and harder candies could cause chipped or cracked teeth. Instead, encourage your child to try some of the softer sweets, which will be easier on those pearly whites. Keep an eye on your child this Halloween–but don’t worry too much. With proper care from parents and regular dental appointments, occasional treats won’t hurt your child’s teeth. If you haven’t made your child’s next dental appointment, schedule one today!